Pedal your way around Moyhu and into the picturesque King Valley. Your choice of 4 supported recreational rides….3.5km, 25km, 43km or 82kms. Discover the beauty of cycling in Moyhu and the King Valley with wonderful support from West End Cycles and a tam of dedicated volunteers! The rides are in small numbers, not races and all about having a relaxed and fun time. 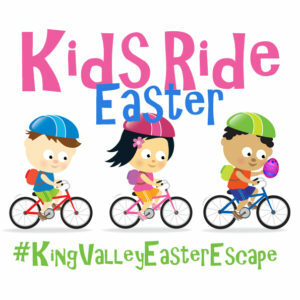 The 3.5km KIDS RIDE is the easiest of the 4 Easter Escape Rides. The route is on a bike path separated from the road. The riders are to encouraged to dress up and ride with their families on an Easter decorated trail from Moyhu’s Town Centre to the Moyhu Primary School, where there will be some more Easter themed fun! $5 per child includes a sausage sizzle lunch, a pair of bunny ears and small Easter egg. $2 for accompanying adults includes a sausage sizzle lunch. 11:00am Start from The Lions Club Market, Moyhu. BOOK NOW. The 25KM PRETTY PEDAL is the easiest of the longer distance Easter Escape Rides. The route is largely flat for the 1st half with some undulations in the 2nd half. The riders are moving through “Kelly Country” and have a unique opportunity at Greta to visit the grave and pay respects to one of the most significant and controversial figures in Australian history, Ned Kelly. Great views of the lower King Valley face the riders as turn east and head back towards Moyhu. Keep a look out for Mt Buffalo. $40 per head includes support, bunny ears and a lunch voucher. Rider numbers strictly limited. 10:30am Start from the Lions Club Market. BOOK NOW. The 43KM GRAVEL GRIND is NEW in 2019 thanks to West End Cycles! $60 per head includes support, refreshments, bunny ears and a lunch voucher. Rider numbers strictly limited. 10:00am Start from The Lions Club Market. BOOK NOW. This ride 82KM SCENIC ROAD RIDE moves though the rolling hills of Hansonville over to Greta South and then Molyullah at which time you leave the Killfera Road and climb gently up to the Lurg “dales” and cruise along a very quiet sealed road. You have now moved into sheep country. Keep an eye out for some impressive houses on the tops or the surrounding hills. Some are for sale! Enjoy the roll down the Boggy Creek Valley and back to Moyhu (and Lunch). $80 per head includes support, refreshments, bunny ears and a lunch voucher. Rider numbers strictly limited. 9:00am Start from the Lions Club Market, Moyhu. BOOK NOW.